I have mentioned the UTIC (Unavoidable Trifecta of Investment Costs) before. These are things that erode your savings, and the only thing you can do about it is make sure your savings grow at least as much as the unavoidable costs of taxes, fees and inflation. But there is another way to increase your savings, that is to reduce your cost of living: the money you have to spend for living comfortably in Canada. This includes housing, clothing, food, cell phones, parking, transit, Netflix, etc. Some of these are unavoidable, everyone needs shelter, food, and clothing. 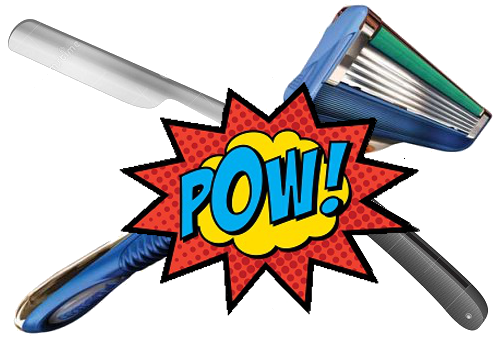 But there are ways to reduce most costs, and today, I’m going to write about a personal favorite cost-saving decision: shaving with anything other than disposable razor cartridges. There are definite environmental advantages to avoiding disposable razor cartridges, but this is a finance blog, so let’s look at the numbers. I’m certainly not the first blogger to look at the cost of shaving, sharpologist.com has a fun write-up about the costs of various shaving options. According to sharpologist, straight-edge razors are the least expensive, by far. I can vouch for that. I personally shave with a straight-edge. I spent $70 on the initial blade, $40 on a strop, $35 on a brush, and $50 on a sharpening stone. About $200. That was almost 10 years ago. That’s really all the money I’ve spent on shaving in the last 10 years, about $20 per year. According to Gillette, I could get 5 weeks of shaving out one disposable razor cartridge. According to walmart.ca, 12 cartridges cost about $52. That means, I could get just over a year’s worth of shaving for about $50. Over 10 years, that works out to $500, $300 more than what I’ve actually spent. Consider the next 10 years, my real straight-edge cost remains at $200 while the cost of using Gillette’s disposable cartridges will rise to about $1000. Over my lifetime, I can expect to save $2000-$2500 from using a straight-edge. Given the more intimidating learning process, straight-edges are not for everyone. But that’s ok, there are still better options than disposable cartridges. Classic safety razors are also inexpensive, as are their replacement blades.